What does cricket farming have to do with Primaris or the Quality Talk podcast? 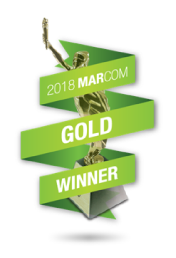 This isn’t exactly a nuts-and-bolts episode about healthcare quality improvement and how to make the best use of healthcare data. But the Quality Talk/cricket connection really isn’t much of a stretch. Quality Talk has examined the subject of social determinants of health – which includes food and nutrition – several times, and the Primaris vision is “Effective healthcare solutions to enrich quality of life.” That’s pretty heady stuff. And without access to healthy, sustainable food supplies, well, life wouldn’t have much quality, right? Besides, edible crickets is just a fun topic. And if we can have some fun while we learn and think, isn’t that a win for us all? Episode 64 also features a new Quality Talk voice, Allison Schwent, Primaris's director of finance. Allison was among Primaris staff that “chowed down on some samples” at our January staff meeting. She’s co-hosting this episode with Jodie Jackson Jr.
1:04 – The Rolin farm is in Belgrade, in southwest Montana. “Mountains everywhere … We’re just kind of in a snow globe surrounded with mountains," he says. Kathy (CEO) and James (COO) met while in the US Coast Guard. After more than a decade of marriage, three kids, a couple businesses, and a life changing bankruptcy they found themselves in their “forever home”: Bozeman, Montana. Read their story here. Cricket farming isn’t a novel concept. It’s a serious vocation and an industry that is getting off the ground. “Its agriculture, it’s farming, and it is definitely a serious vocation,” James says. The business has eight partner farmers. “It is an industry that is growing very rapidly.” He expects to have 50 to 60 cricket farmers on board before the end of 2019. The most recent Bug Buffet featured an off-campus tour of Cowboy Cricket Farms. But Allison wants to know if the family makes crickets a regular part of meals. 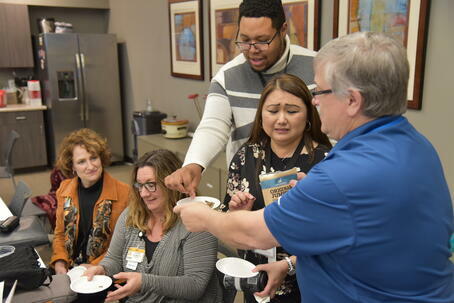 “We eat them mostly as a snack and to add a little extra nutrition … I prefer them as more garnishment or snack,” James says. Roasted Jumpers, Chocolate Chirp Cookies. A common misconception is that the Cowboy Cricket Farms products are all-cricket ingredients. 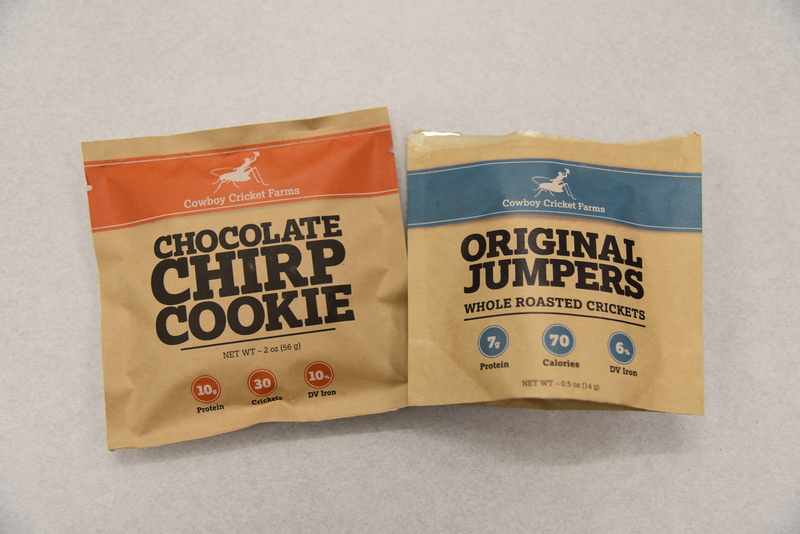 But, for instance, the Chocolate Chirp Cookie is all the traditional ingredients plus cricket powder, which is the equivalent of 30 crickets. “Most people use the cricket powder to substitute” for some of the flour, which will increase iron, protein, and lipid intake. Pound-for-pound, compared to beef, cricket farming uses 2,060 times less water, 14 times less feed, and produces 80 times less methane, using less than 1 percent of the comparative land mass. James is used to the predictable eye rolls when some insect-wary crowds or individuals hear about his enterprise. But insects as food is only “a new thing” in Western culture. He says 80 percent of the cultures around the world eat insects. “We’ve been changing how people relate to their food." Cost reflects low supply, high demand. It’s simple economics. 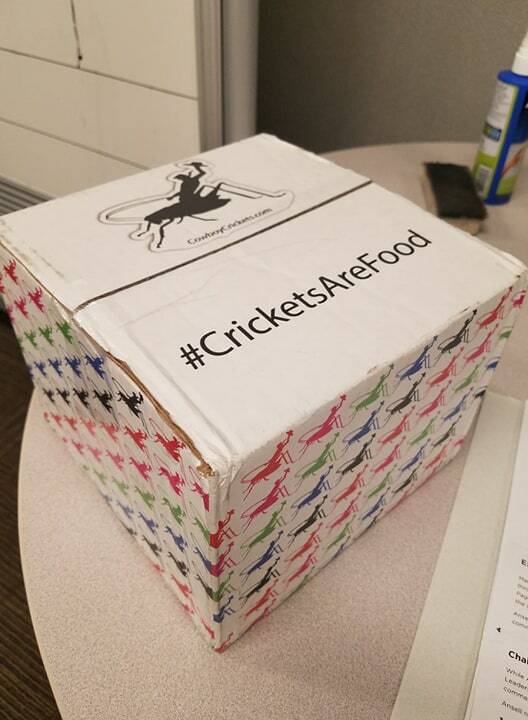 One pound of cricket flour – 100 percent crickets, used to supplement regular food preparation – is $54. What would be a sustainable figure? 18:28 – “The pricing hasn’t been very volatile, but it has trended upward. There’s more demand, but the supply hasn’t shifted very much.” A pound of cricket powder can help make 16 dozen cookies. Long-term, the price shouldn’t be $54. The farm plans a new product line of pre-mixed protein powders. The nuts and bolts of cricket farming. Crickets are “harvested” by freezing. About 3,000 dehydrated crickets (they lose about three-fourths of their weight when dehydrated) is the equivalent of one pound of powder. The realm of health and safety regulations is also developing. Another advantage of cricket farming: “It’s good business sense. You can grow them indoors, year-round, no matter the climate,” using an existing building that doesn’t need to be purpose-built. Currently, farms range from 400 square feet to 7,000 square feet. It takes about 11 days for the eggs to hatch, which requires a steady 70 to 90 percent humidity and 94 degree environment. The crickets reach adulthood at six weeks. Males chirp, females find them, and they mate. The whole process starts again. Females can lay about 14 eggs per day. “You can grow the population of crickets on your farm very, very quickly,” he says. Why crickets and not grasshoppers … or tarantulas? How time- and labor-intensive is cricket farming? Separating living crickets from the dearly departed. 41:00 - “Crickets basically take care of the separating themselves.” When it’s time to harvest, the farmer shakes off all the egg cartons that the crickets have climbed to hide. The frass – waste and dead crickets - remains on the floor or tray and is easy to collect.